The detached market remains relatively quiet. There’s not a whole lot going on, sales are low, new listings are ticking back upwards but nothing worth talking about and prices look pretty flat. But i’ll let the stats do the rest of the talking. For reference you can view the September data here. Detached sales are pretty weak. There’s been an uptick on a year over year basis. However, I’m not sure i’d call it a “recovery” from the foreign buyers tax. Sales on a year to date basis are still down significantly. As you’ll see in the charts below, detached sales are higher this October than last October, but remain well below the 10 year average for the month. I’m hoping these charts also paint a more obvious picture. You’ll see monthly sales laid on top of the 6 month rolling average. What you’ll notice is that sales peaked in early 2016, fell hard after the foreign buyers tax, enjoyed a small uptick this spring and are now about to roll over as we head into the slow winter months. New listings are up significantly from a year ago. It appears sellers have also digested the foreign buyers tax and appear more comfortable with selling in today’s market. I think it’s also hit home (no pun intended) that the detached market has peaked and sellers are coming to grips with that reality. New listings for the month of October were 17% above the 10 year average in Vancouver East, 7% above in REBGV, and Vancouver West was slightly below the 10 year average at 4%. 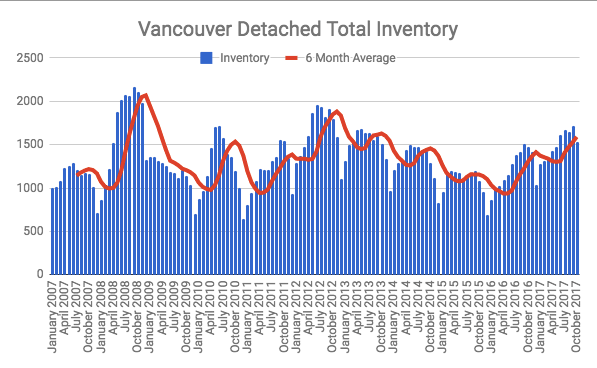 Inventory levels continue to climb in Vancouver, up 4% on a year over year basis, but as you can see the trend is clearly up after bottoming out in December, 2016. Vancouver (East & West) total inventory. All three areas are in what’s considered a ‘balanced market’ per the Real Estate Boards standards. 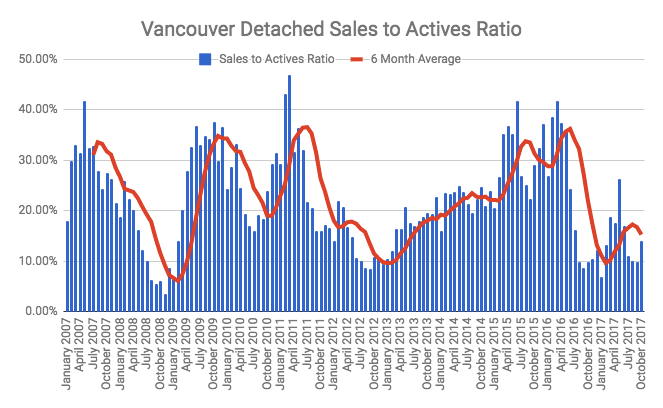 While the average detached sales price for REBGV is up 12% on a year over year basis in October it’s important to look at it from a wider angle. I feel the 3 month rolling average is a more accurate reflection of current prices and i’m confident most Realtors would agree. Peak prices are behind us, at least for now. It’s a bit of a mixed bag in the detached market. Nice homes in good areas that are well priced are selling and sometimes in multiple offers. However, there are also plenty of homes which are sitting on the market for 30, 60, 90 days. The long term averages clearly show sales falling, inventory rising, and stagnant prices. Expect overall activity to continue to slow in the winter months ahead. Stay Informed. Join My Weekly Vancouver Real Estate Round-Up.